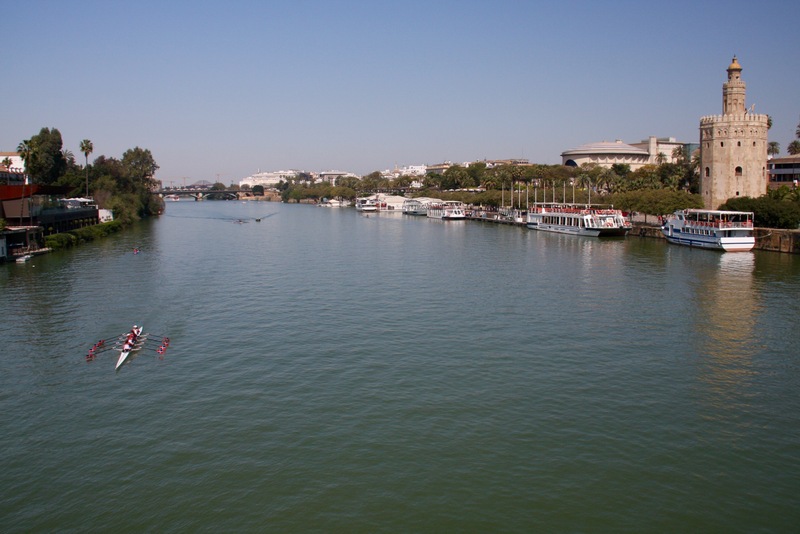 Seville’s long and majestic history has been made possible by the fact that the city sits on the banks of the broad Guadalquivir, Spain’s only great navigable river. Flowing into the Atlantic Ocean at the Gulf of Cadiz, it was perfectly placed to make Seville the great port of the Spanish Empire. It helped that the city held a royal monopoly on trade with the new colonies in Latin America. The vast wealth of Aztec gold and Incan silver poured east on Spanish ships crossing the Atlantic and, with them, the Spanish Golden Age sailed up the Guadalquivir to Seville. The city grew enormously wealthy. The architectural legacy left behind by 500 years of Moorish rule, was immeasurably enriched as Seville grew in size and grandeur. Today, it has one of the most attractive centres in Europe. The city is forever associated with Christopher Columbus, who set sail and returned to Seville on his four voyages to the New World. The marble tomb holding his remains has a prominent place in the Catedral de Santa María de la Sede, measured in cubic metres it’s apparently the largest cathedral in the world. His massive tomb is hoisted on the shoulders of four giants, who represent the ancient kingdoms of Spain. The river is as good a place as any to start an exploration of the city. Sitting serenely on the eastern bank, the 13th century Torre del Oro is one of Seville’s great landmarks. 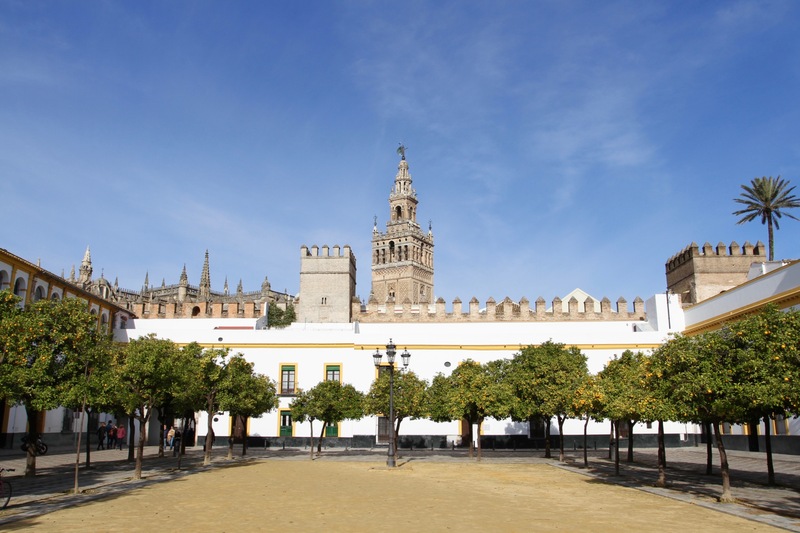 Built as part of the river defences when this was capital of Moorish Spain, it offers panoramic views down the river and across Seville’s rooftops to the cathedral. We had a stroll along the river bank, and then into the city proper on our way to La Macarana. We headed into the bewildering maze of narrow streets that was once the old Jewish quarter. 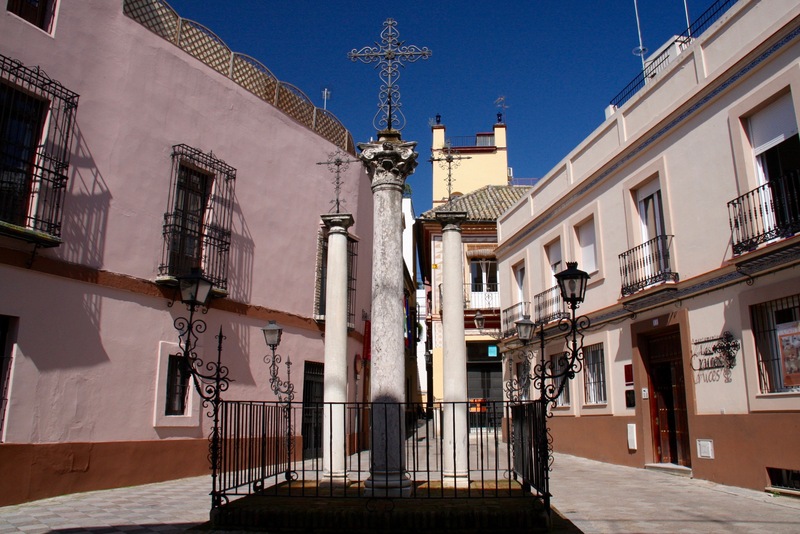 Today barrio Santa Cruz is the main tourist area, but it remains an atmospheric place. 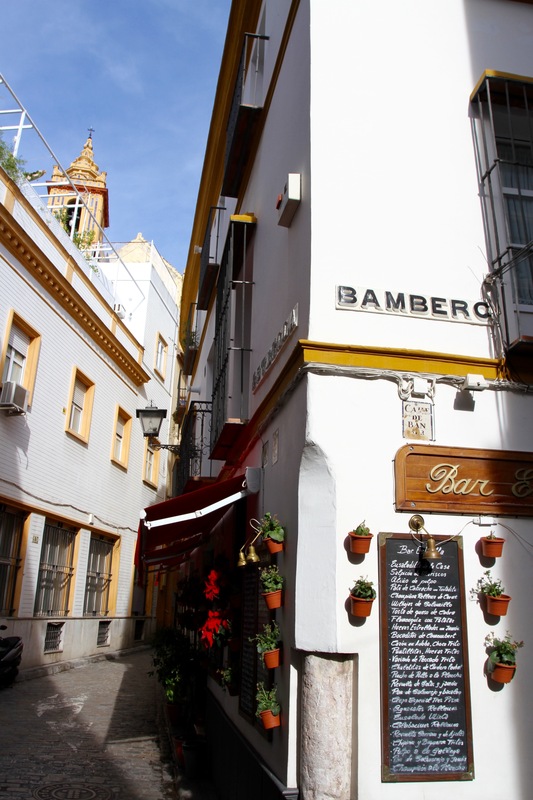 The labyrinthine streets are a result of the entire jewish population being forced into this small barrio after the city was captured from the Moors. The narrow streets keep the sun out, but must be oppressive in the height of summer. They reminded me of the stifling world conjured up in Lorca’s House of Bernarba Alba. 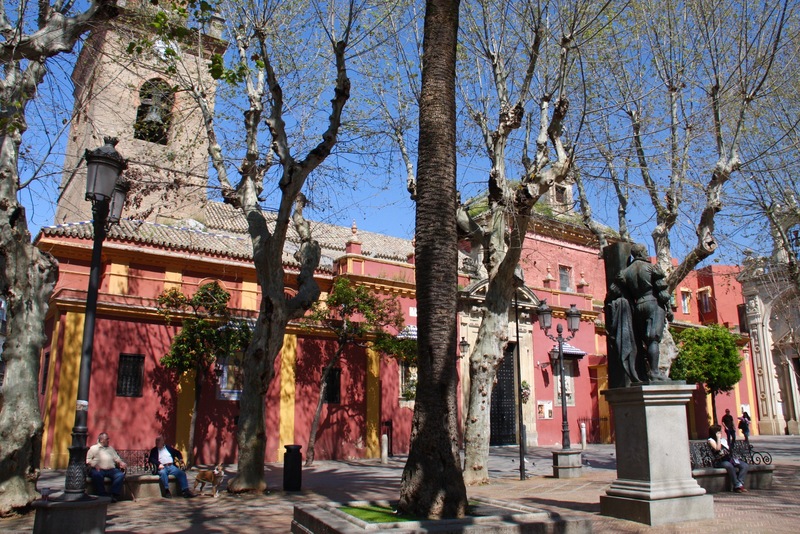 Santa Cruz is full of small plazas, fountains, churches and tapas bars. It’s impossible to go far without coming across an inviting tapas bar offering a delicious speciality of the house, washed down with a chilled fino sherry. We’re easily distracted by nicely tiled tapas bars filled with hanging legs of jamon iberico, which could explain why it took us so long to explore this area. It’s difficult to describe the route we took to reach La Macarana, except to say that in Seville it’s both unnecessary and nearly impossible to follow a route. We wandered generally in the right direction, popping down streets that looked interesting, and stopping to visit the occasional market or church. I could meander around these streets for weeks and never tire of it. 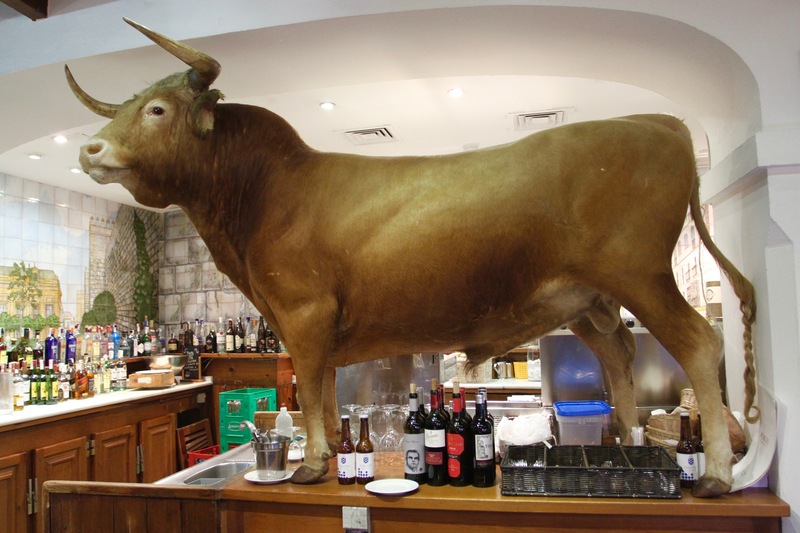 We stopped in an ancient looking tapas bar filled with bull fighting memorabilia, photos of Seville’s great and good posing with the proprietor hung on the wall. 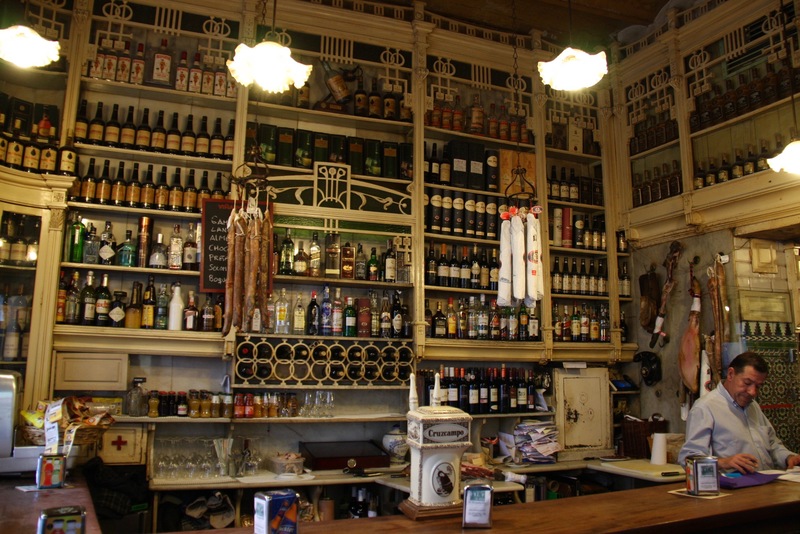 It was an unlooked for surprise of a place, but Seville is full of similar surprises. We eventually arrived in La Macarana, where we hoped to visit the Basilica de Nuestra Señora de la Esperanza Macarena, home of the famous Virgin of Hope of Macarana. We’d had a long day exploring the city, luckily the Macarana area is full of good tapas places, and a newer crop of gastro pubs serving up microbrews. We made a leisurely journey back toward the centre, planning to go to our hotel in preparation for an early start into the Sierra de Aracena in the morning. Before we got too far though, the sound of music attracted our attention. 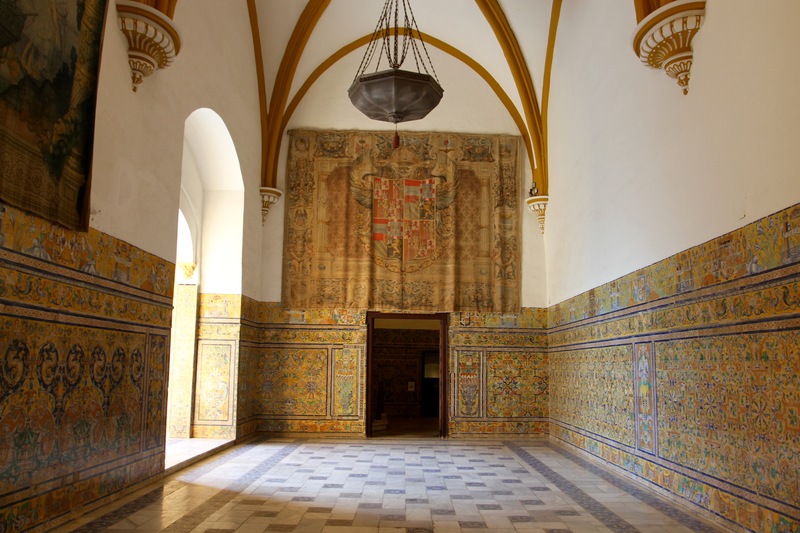 Words fail to express the extraordinary beauty of Seville’s Alcázar Palace. 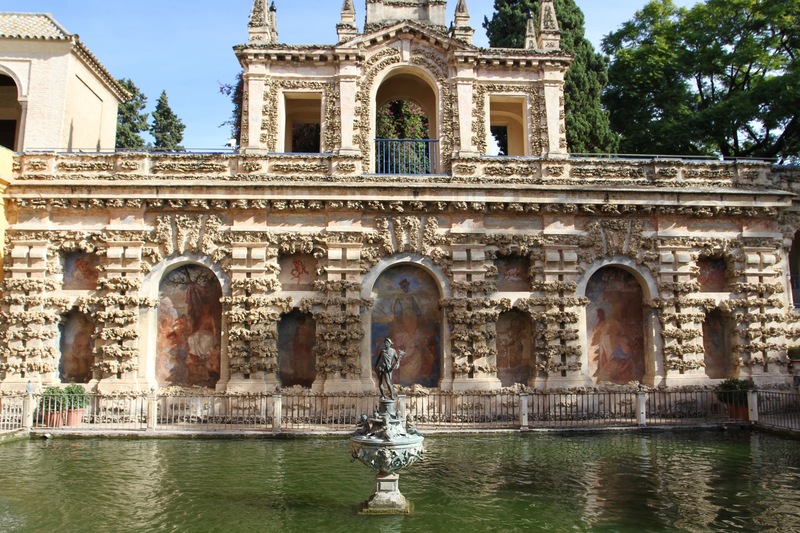 In reality, it’s three palaces in one, built over the centuries by Seville’s different rulers, with attached formal gardens filled with shaded, tree-lined avenues. For three centuries this was the epicentre of Islamic civilisation on the Iberian peninsular. 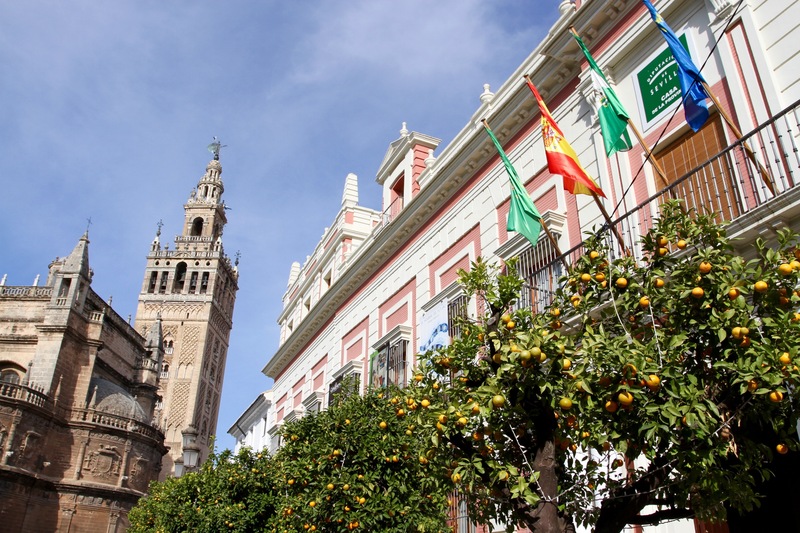 On the other side of Plaza del Triunfo, where today the cathedral stands, was Moorish Seville’s grand mosque. Maugham goes on to describe the powerful visions of Moorish Andalusia that he’d had travelling through this part of Spain. He recounts seeing “a Muslim knight riding in pride and glory, his velvet cloak bespattered with the gold initial of his lady”. His imaginary and romantic visions of Al Andalus before the Reconquista culminates in a savage battle battle between Moorish and Christian forces. Despite its appearance and Islamic history, much of the Alcázar dates from after the fall of Seville to Castilian forces in 1248. There are several architectural styles, added by Spanish monarchs who used this as a royal residence over the centuries. 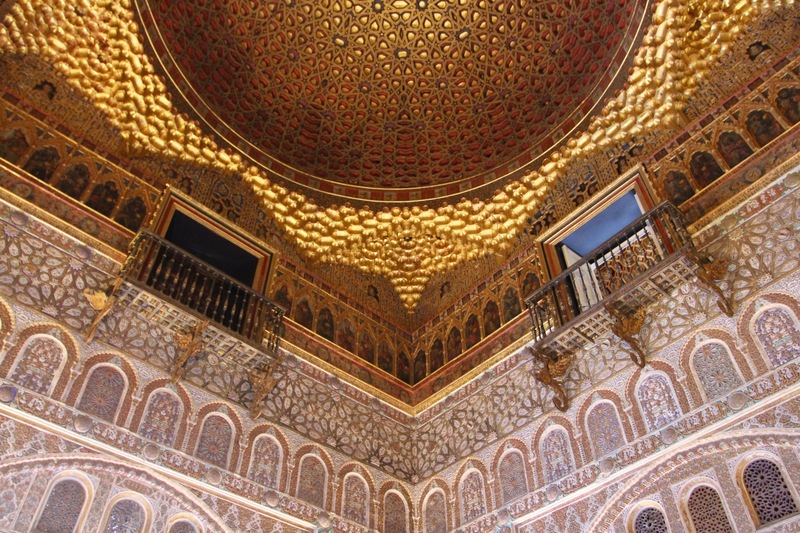 Much of it though, was constructed in the Mudéjar style of North Africa by Moorish craftsmen under Christian rule during the reign of Pedro the Cruel, as he’s known to history. The Alcázar is undoubtedly one of the highlights of a visit to Spain, and consequently comes with a proportionate number of tourists. It’s worth booking a ticket and getting in as early as possible if you want to be there before the tour groups start arriving. We were visiting outside of the main season, but a Spanish national holiday made up for any lack of international visitors. Some areas of the palace were pretty crowded, but that doesn’t take away from the joy of exploring this amazing place. The exquisitely delicate architecture is delightful, and the scale and detail of the buildings and gardens absorbed half a day of our time. It passed in the blink of an eye. 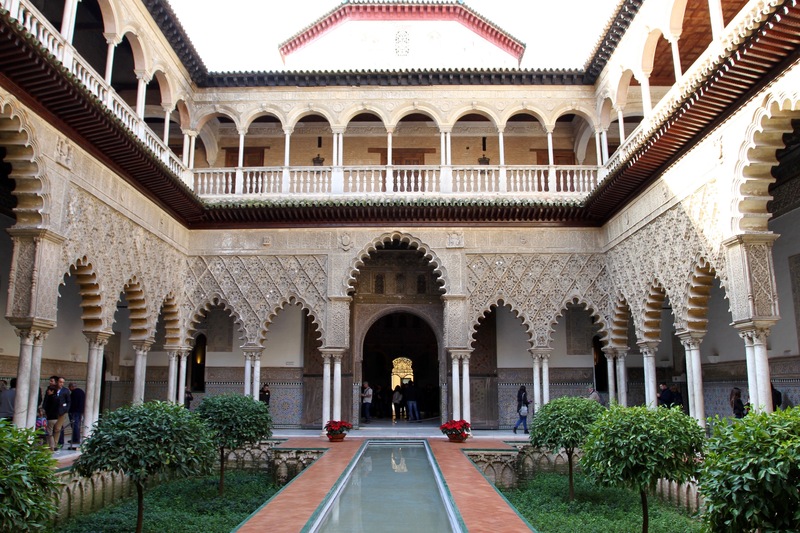 The first Moorish palace was built here in the early 10th Century, making it the oldest royal residence still in use. After the a few hours of marvelling and getting a cricked neck viewing the carved and tiled interior rooms, we arrived in the gardens. After the busy palaces, these were a scene of peace and tranquility. It’s remarkable how few people make the effort to explore the gardens beyond the areas close to the palace. 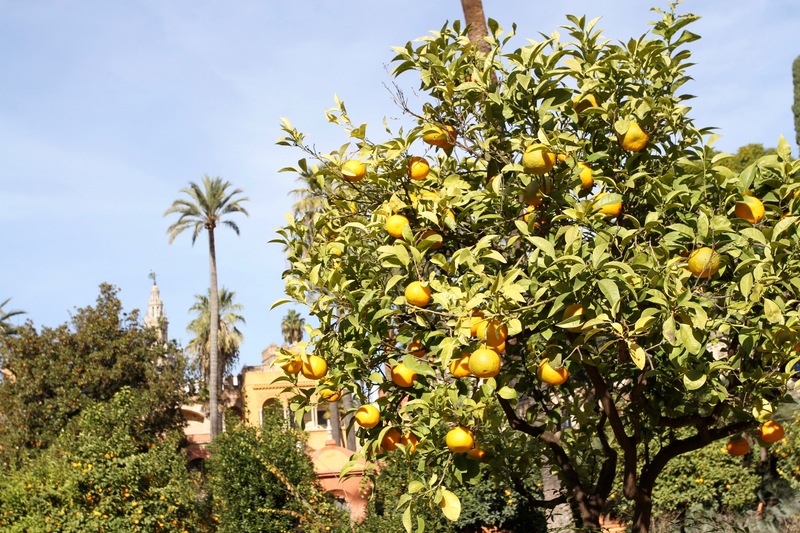 We often found ourselves walking alone amongst the orange, lemon and pomegranate trees. 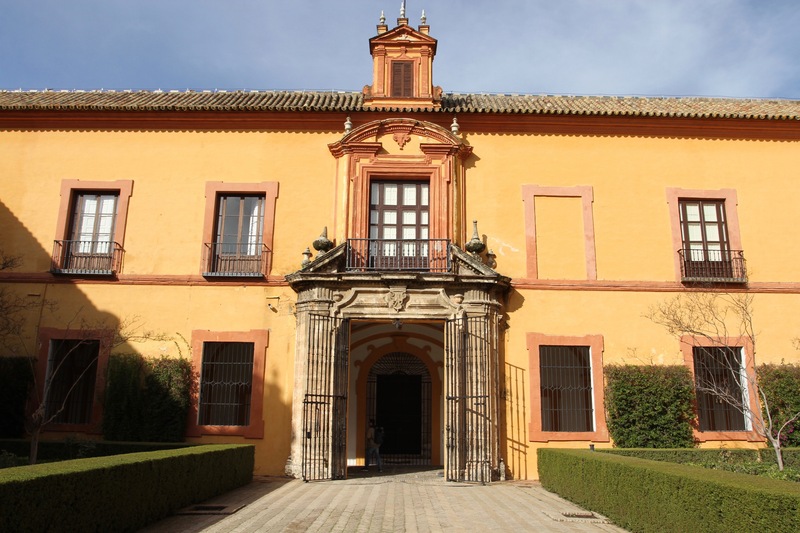 It’s no surprise to discover that the Alcázar has been the backdrop for many films over the years. It played a starring role in the 1962 film, Lawrence of Arabia, and Ridley Scott’s medieval crusader epic, Kingdom of Heaven. More recently, it features in the immensely popular Game of Thrones series, as the royal palace in the Kingdom of Dorne. This really is a place where fantasy and reality merge. 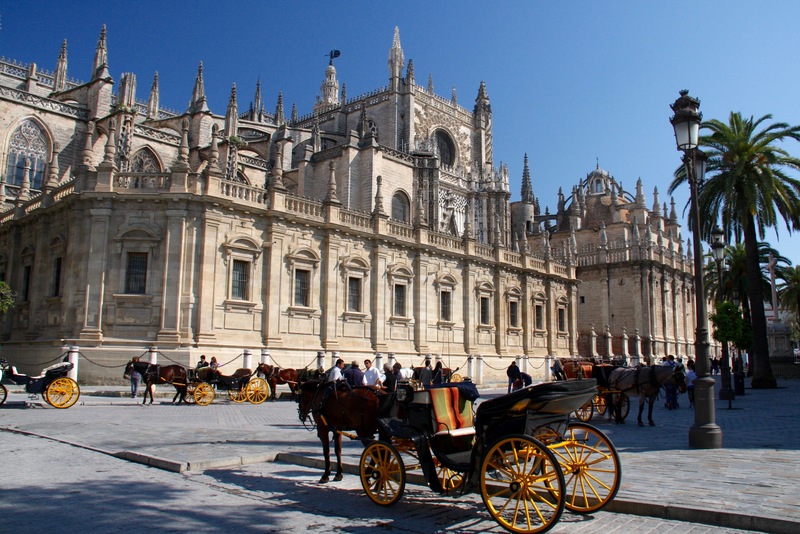 Seville is one of the most vibrant towns in Spain, and a genuinely exciting place to visit. Famed as the home of flamenco, with a legendary culinary scene, and a buzzing nightlife that rarely ends before the small hours of the morning, it seems to condense the spirit of all of Andalusia into its tightly packed streets. Home to just over 700,000 people, it has the feel of a much bigger city and a small town simultaneously. 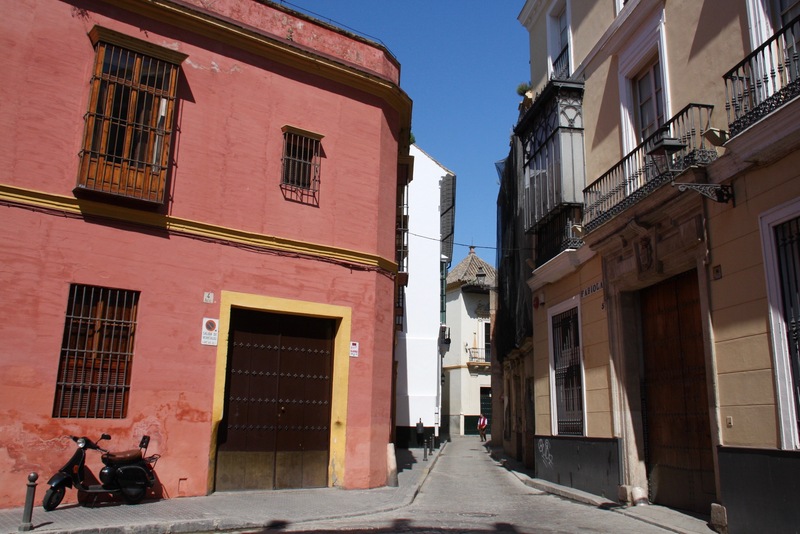 Seville’s compact historic centre, and fascinating barrios of La Macarena, Alameda, Santa Cruz and Triana, are some of the most atmospheric of any city in Europe. It combines strong Moorish influences, with classical Spanish Golden Age magnificence, and harmoniously blends the ancient and modern. 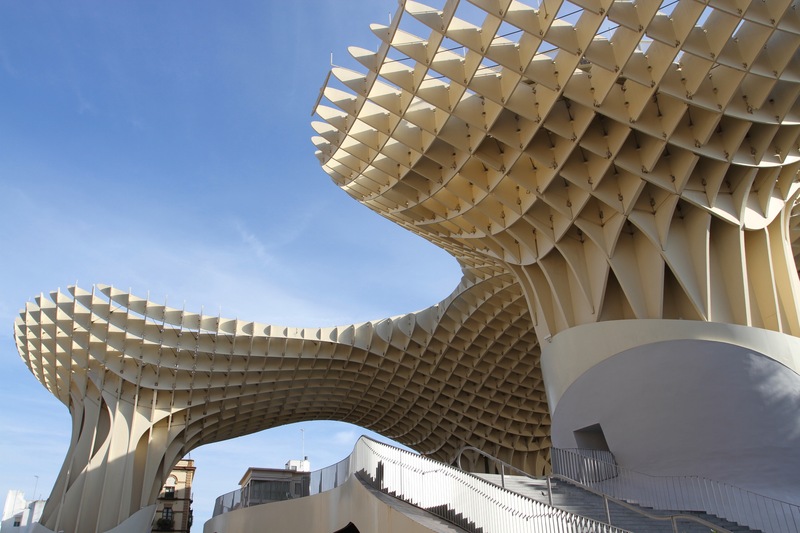 In the heart of the city, the futuristic Metropol Parasol rubs shoulders with the 16th century Iglesia de la Anunciación. Stay in Seville for any length of time and I defy you not to fall in love with it. It’s often described as ‘sultry’, a word applied equally to the weather, music and people, giving the impression that it’s a hotter (in both senses of the word) version of Paris. It’s also a friendly and stylish place where, thanks to the sultry weather, life is played out on the streets. Even in the cooler days of winter, the squares and parks are where you find the city’s pulse. We arrived without much of a plan. 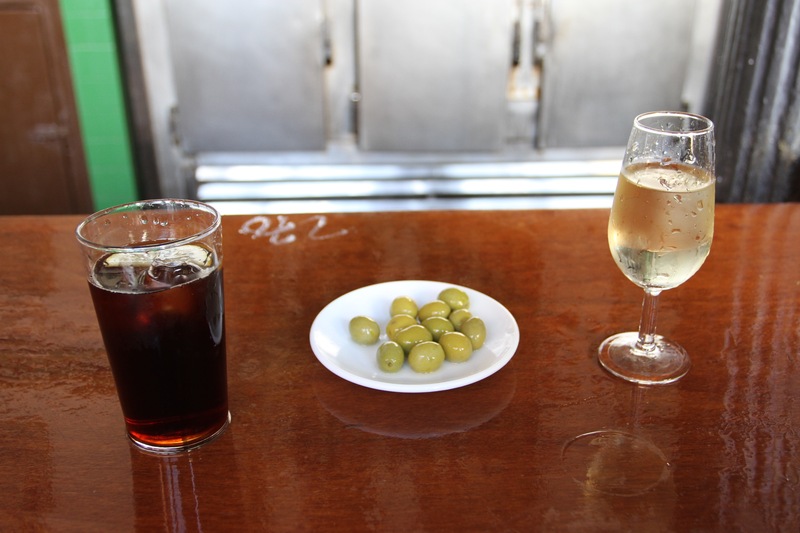 We definitely wanted to revisit several tapas bars, remembered from our previous visit. 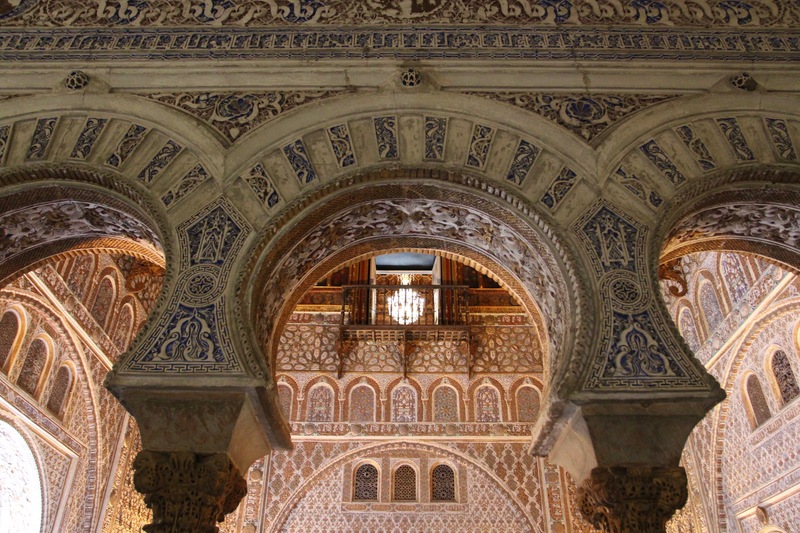 Granada had whetted our appetite for Moorish architecture, so the Alcázar was on our list. 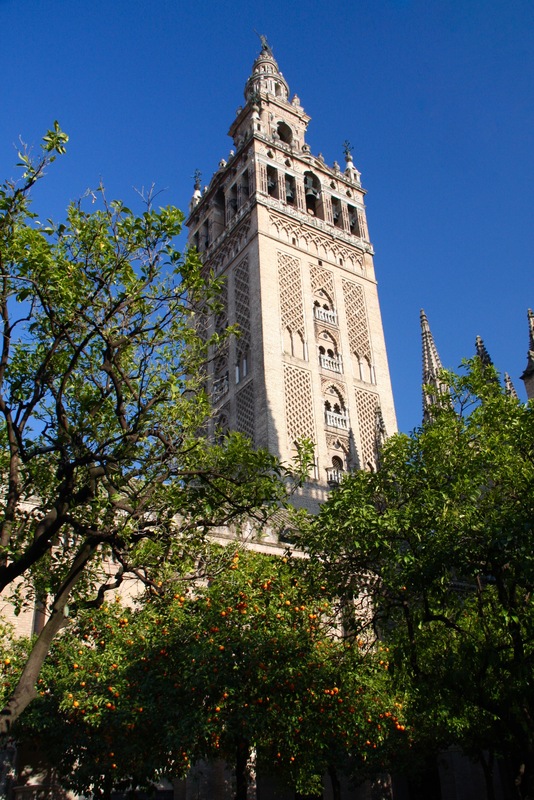 You can’t not visit the glorious cathedral, or a climb up it’s gorgeous Moorish bell tower, the Giralda. The greatest pleasure of being in Seville though, is to simply wander the ancient streets and discover the city at walking pace. 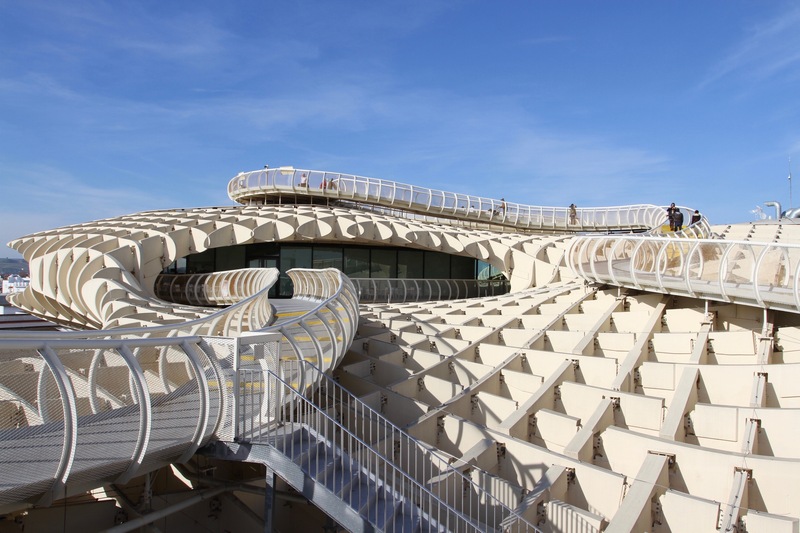 This now includes a walk above the rooftops on the Metropol Parasol. 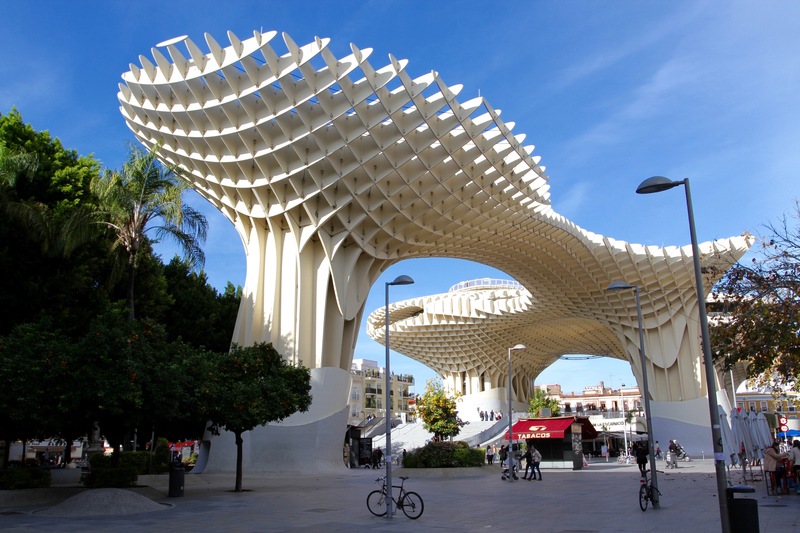 Seville’s ‘mushrooms’, as this addition to the cityscape is known, and not always affectionately, is an extraordinary piece of architecture. Towering over the otherwise ordinary Plaza de la Encarnación, the Parasol does just that, provides much needed shade to the people below. Up above though, it is an undulating walkway offering views over the city. We stayed out of the centre, in Heliópolis, a colourful Seville neighbourhood of beautiful white houses and orange tree-lined streets. It was built for the Exposición Iberoamericana de Sevilla in 1929, a World’s Fair for the Americas. 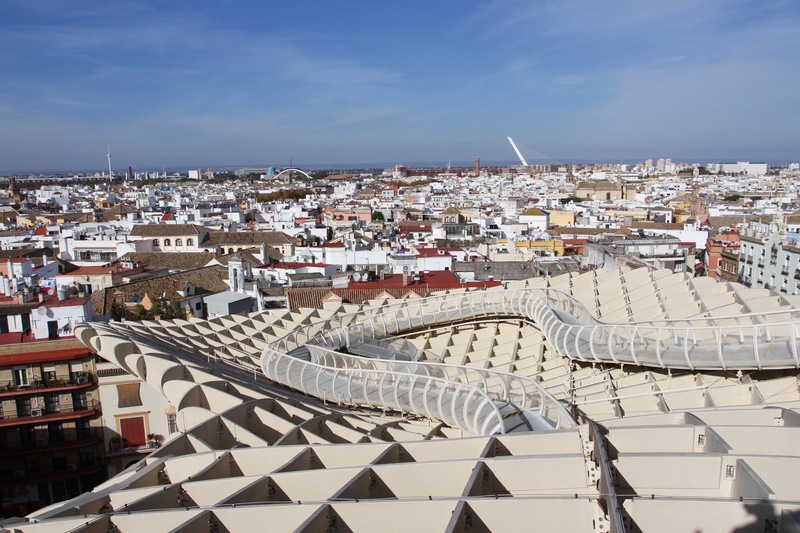 Far from the tourist hoards, the area offers a different perspective on Seville. Our hotel, Hotel Holos, is also one of the nicest hotels we’ve stayed at in Spain.